A midnight ride in a mouse. What could go wrong? First, I’m a New Yorker whose apartment is a mouse superhighway. 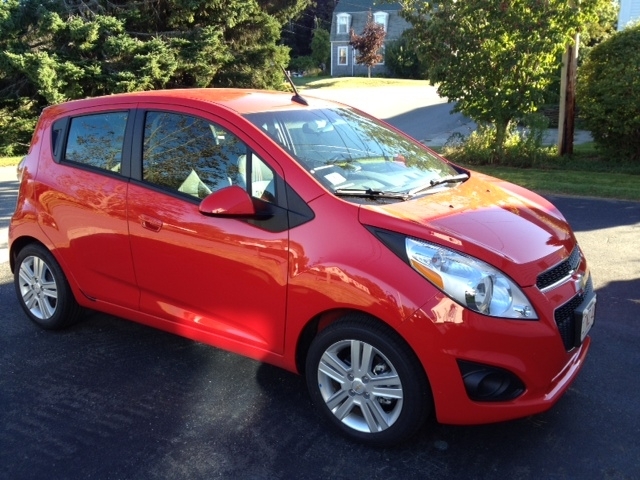 City mice are not cute and the rental car company should have handed me a shot of tequila along with the keys when they rented me a car designed to look like a giant, red mouse. Thankfully my living room seems to be a thruway, not a destination so I squelch my squeamishness. But getting into a mouse car required a whole new level of resilience. I kept focus. It was a way from A to B and I really wanted to get from A to B. Once inside, it looked like a car so what it looked like on the outside only mattered to other drivers and to the cop who pulled me over when I drove through his mousetrap. I’m not above speeding but my mouse wheezed when I hit the gas so I obeyed all posted signs. Liquid courage isn’t practical when driving (as I said, I really did want to get from A to B) so no tequila shots were consumed in order for me to get into this car. I stopped at the light. I took a legal right turn. So when flashing blue lights pierced the black night, my heart jerked as I snapped the car to the side of the road. The officer approached, cop car lights still spinning, a flashlight beam on the license plate and then in the back window and then he was just behind my left shoulder, waiting. And I couldn’t get the window down. When I got into the mouse, I made time for the basics: Ignition, steering wheel, gas, break, lights and radio and I was off. With a chill in the air, I never considered I’d open a window on my midnight drive and in this crucial moment, I had no idea where the window controls were. For some reason, the officer was not amused. He didn’t smile or congratulate me on my herculean achievement of getting my window down. I squinted at the flashlight beam in my face and ignored the wind whistling through the four open windows. He looked at my documents, asked me to confirm the address on my license, walked to the front of the car, walked back and pointed the flashlight back in my face. “You have to turn the lights on … more?” I asked and pointed again to the glowing dash as proof that I wasn’t a stupid as I appeared though I realize evidence had stacked up against me. And then my copper let me go. He bade me goodnight, got into his car, pulled out just a schooch and waited for me to pull safely on to the road. I was grateful all around. He didn’t give me a ticket and he saved me. One of the speeding pick up trucks that regularly travels this road could easily make roadkill out of me and my mouse. But now I just wanted him to leave. I didn’t want to drive away with the windows down and I didn’t want to further embarrass myself, or give him a chance to reconsider, by staying put and taking the time to work out the controls. So I pulled out, wind rushing, windchill dropping and drove, freezing, keeping my eyes and the car on the road while subtly trying to put the windows back in place. Swine has all sorts of pig products, like potato chip nachos with pork belly. And they have an inventive drink list. After a near arrest, who could resist having a “Pig in the City” or a “Buck Up”? 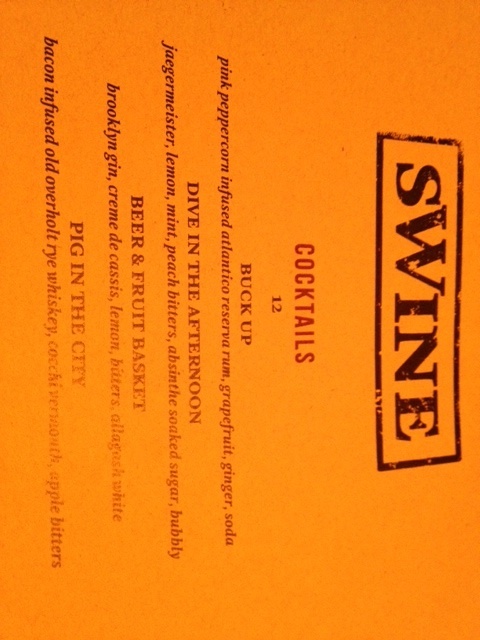 With a drink called “Pig In The City” how can you go wrong? They also have a super friendly neighborhood vibe. So you can pull up a bar stool and tell them a story like this while they mix you up some comfort food and drink and they will laugh with you – and if they want to laugh at you, they’ll be kind enough to do it while you aren’t looking. LOL, Funnier even after the second telling!